With both Rosalie and Riley, I was able to get an ultrasound around 8 weeks. However, with this one I didn't get an ultrasound until 10 weeks. 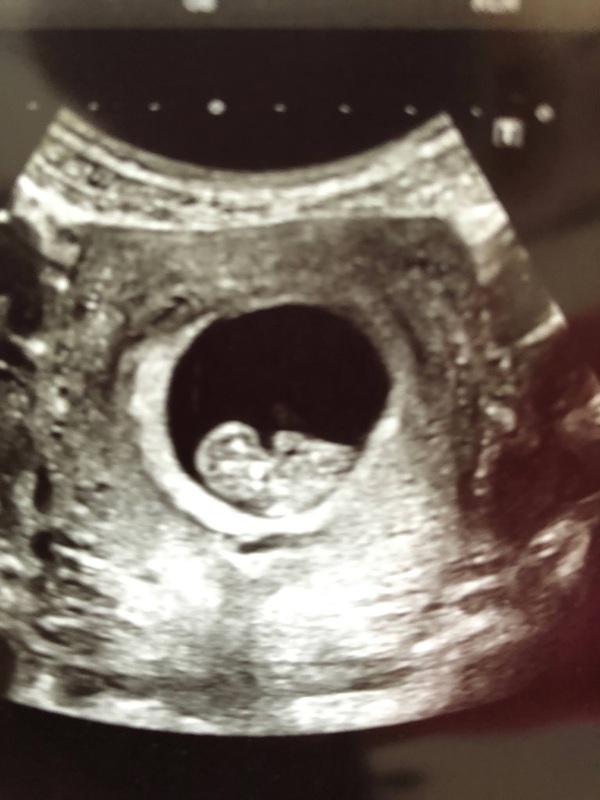 I went in for my first appointment at 9 weeks thinking I would get an ultrasound that day, but I didn't! It was SO hard for me to wait a whole week longer and I am a worrier, so I was very nervous. Thankfully, everything with baby looked great at our 10 week ultrasound and I was super relieved! This time around my morning sickness has been so much different than with my last two pregnancies. With Rosalie I was sick all day from about 6 weeks to 13 weeks and with Riley I was sick from 5 weeks to 11 weeks, but with this one I had really bad sickness all day from about 6.5 weeks to 15 weeks and then it turned into me just being sick when I would eat. I am 22 weeks now and I still get sick when I eat. Some foods are worse than others, but I almost always get sick. This has made it a bit harder for me to eat, but of course I do my best. I am just really careful about what I eat most of the time. I had a guess about the gender with Rosalie and Riley, and both times my guess was correct. However, with this one I was so sure that it was a girl and it wasn't just a guess. You better believe I was shocked when they told us at our anatomy ultrasound that our sweet little baby was a BOY. Thrilled, elated, soooo happy, but still shocked! I don't know if this is just me not remembering correctly or what, but I feel like I was so much more tired at the beginning of this pregnancy. It may have been because I had two kiddos to care for instead of zero or one, but either way, all I wanted to do was sleep. For about the first 4 months I felt like I needed at least 10 hours of sleep to function, which is about 4 hours more than I usually get ha! I'm sure there were/are about a billion other differences that I'm not thinking of right now, but these are some big ones. What are some of the differences that you experienced with your pregnancies? You look incredible! I am excited for the little man to get here!